Chris will be on the panel tonight with LA Weekly food critic Jonathan Gould, USC professor and author Barry Glassner, truck owner Miriam Torres, and Chow Hound’s C. Thi Nguyen to discuss the legislation and uncertain future of LA’s wheeled eateries. Go to their website for more info as seeting is free but a reservation is required. Due to popular demand, we’re selling T-Shirts to help you spread the good word. The first batch has finally arrived and looks awesome! Order one today for just $15 (plus shipping). Go to our store so you can be the first at Leo’s to be seen wearing your new threads. New: Check out our CafePress store for more designs and products, including hats and stickers. Don’t forget to sign the petition if you haven’t already done so! Please be patient. Try refreshing the page if it does not load. You may contact us if you are having trouble and we will add your name to the list. Thanks to your overwhelming support, we have had to expand the petition to a FIFTH page. Sign below and join the over 8000 other supporters! Led by District 1 County Supervisor Gloria Molina, the L.A. Board of Supervisors has passed new restrictions that will effectively eliminate taco trucks from our streets. Under Supervisor Molina’s new rules, taco trucks will have to change location every hour, or face a misdemeanor charge carrying a $1000 fine and/or jail. Yes, jail. Taco Trucks are a special facet of Los Angeles, and something we don’t want to lose. Though this ordinance currently affects just unincorporated parts of L.A., that’s 65% of the County. And of course it opens up the doors for legislation closer to home too. Let’s send Gloria Molina and the L.A. Board of Supervisors a message that we cherish our local vendors and don’t want to see them move away. This new law needs to be repealed! *NEW:* ¡Taco Libre! shirts (and more) available exclusively at CafePress! 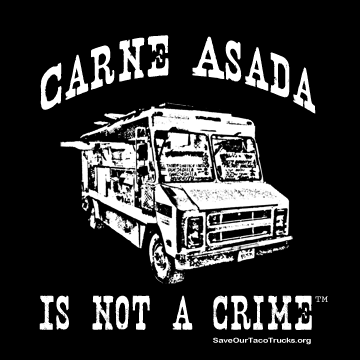 The new county ordinance against Taco Trucks goes into effect on May 15th. 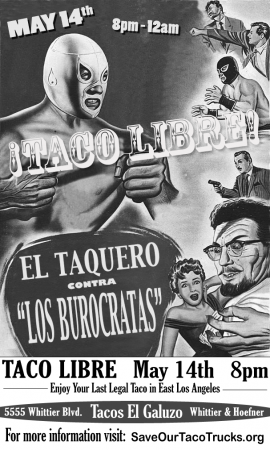 On Wednesday, May14th, we’ll be celebrating one last night of freedom for the Taqueros with ¡Taco Libre! Join us in East Los Angeles at Tacos El Galuzo, at 5555 Whittier Blvd in East Los Angeles, for a final show of support! And of course, don’t forget to sign the petition if you haven’t already done so! Click on the poster to download a PDF that you can print and post in your neighborhood (note: the poster is Legal size 8.5×14)! Due to popular demand, we’re selling T-Shirts to help you spread the good word. As the first batch will take roughly 7-10 business days, we’re offering them for only $15 (domestic shipping included) to thank you for your patience. Go to our store so you can be the first at Leo’s to be seen wearing your new threads. Due to overwhelming support, we have had to expand the petition to a FOURTH page. Sign below and join the over 6000 other supporters! Thanks to all of you, Taco Night L.A. was a huge success. Japanese news, Spanish language news, and even a freelance doumentarian were at Tacos La Estrella (54 & York) to help spread the word. Saving the trucks has become a minor sensation with the L.A. Times, New York Times, and even Reuters getting on board. Anecdotal information from friends and other blogs indicate that this was the case all over the county. Unfortunately, not everyone sees this issue as clearly as we do. The supervisors’ offices have remained largely unmoved by your signatures. Specifically, Supervisor Molina believes that most of the signatures are coming from outside of her district. (Ironically, it doesn’t seem to matter that the petition started in District 1). Let’s keep the heat on the board and let them know that this isn’t just something that will be forgotten next week. Email them, call their offices, sign the petition, and explain what your personal reason for keeping the trucks is. We’ll be selling shirts early this week, so soon you’ll be able to advertise without that awkward segue “speaking of birria…”. We don’t have the money of the special interests, but we do have the votes and the numbers. As representatives, they are supposed to represent their constituents. Let’s tell them what we want! Not sure which district you’re in? Find out here. Due to extremely high volume, we have had to expand the petition to a THIRD page. Sign below and join the over 4100 other supporters! 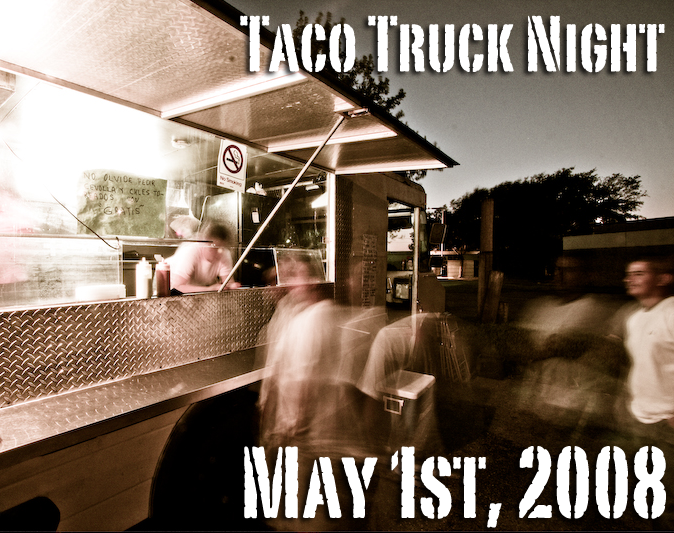 As mentioned in The Los Angeles Times, to celebrate this year’s May Day we’re announcing Taco Truck Night. Take your family, your friends, or anybody else who loves tacos. 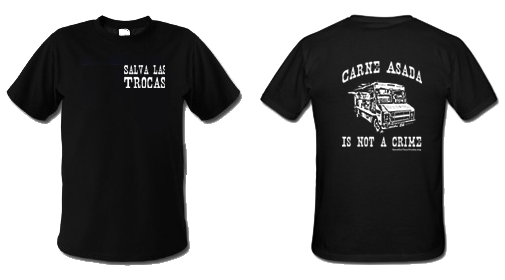 Go out, get some carne asada or al pastor and support your local hard working taco vendor. While you’re there be sure to hand out some posters and tell your fellow Angelenos what’s happening to our beloved Taco Trucks. We’re looking to raise awareness in the community as well as provide a nice cash infusion to the hard working men and women who labor into the early hours to keep our bellies full. Below are some suggestions for taco trucks throughout the greater Los Angeles area. This list is by no means exclusive so strike out and explore a little. Know a great truck? List it on our petition. You can also try the venerable Great Taco Hunt for more suggestions. 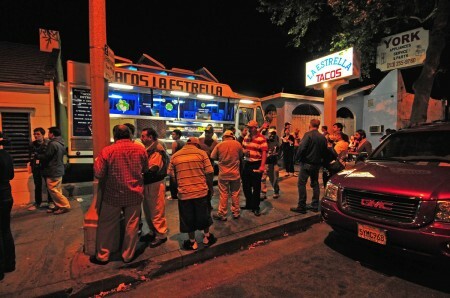 Aaron and I will be stuffing our faces with Asada and Carnitas at the La Estrella on York and Ave 54 around 8 PM. Hope to see some of you there! Due to extremely high volume, we have had to expand the petition to a second page. Sign below and join the over 2300 other supporters! Top | Contact Us | YORK BLVD.